Membe rs at the Bay Club restaurant recently enjoyed a spectacular wine dinner at the Golf House hosted by Tim Bishop and his team from United Liquors Connoisseur Division. 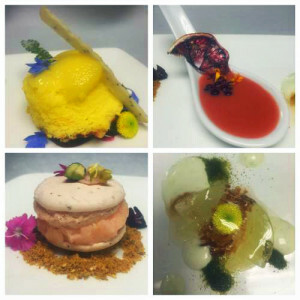 Executive Chef Jim Mercer along with Sous Chef Mary Towers and Chef George Karos prepared a meal featuring fresh local favorites which was then paired with an exciting and complex wine selection chosen by Tim. The evening began with hors d’oeuvres which included several radish varieties, along with Country-style Paté in Endive and Ibérico Pork Saucisson. 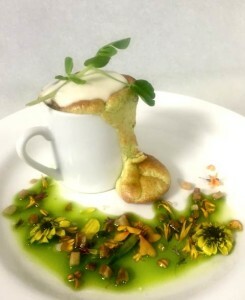 The first course, a Pea Souffle garnished with mint oil and rendered guanciale was paired with Chapoutier Crozes Rushe, a Syrah wine from Rone Valley, France. With tastes of ripe fruit and a peppery finish, the wine perfectly rounded out the dish. The next course featured Skate Wing, seared golden brown with fresh morel mushrooms, ramps and brown butter sauce, paired with an oak barrel aged Chardonnay from Daou Vineyards, California. 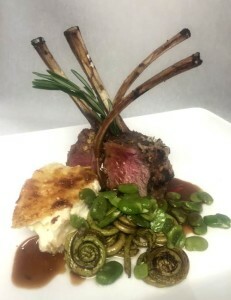 Roasted Lamb Racks followed, served with Dauphinoise Potatoes, Fiddle Head Ferns, Fava Beans and Red Wine Demi-Glace accompanied by “The Pessimist” Red Blend also from Daou Vineyards. Primarily a Syrah with Zinfandel, Petite Syrah and Grenache grapes, it complemented the lamb flawlessly with its balance of rich blackberry, cherry, vanilla and anise with robust tannins. All who participated greatly appreciated Tim’s and his team’s wine knowledge and expertise along with the amazing meal prepared by the Bay Club kitchen.